I always love to check out beauty products that are new-to-market, whether they involve a technological breakthrough or are just cleverly packaged tools I use on a regular basis. So, today I’m sharing with you my latest favorite finds (I’ve purchased all except the Opal, which I plan on saving up for). These products make my usual routine so much easier and, with the exception of the Clarisonic, they are incredibly affordable too! What a wonderful post! I have been meaning to purchase the Revlon nail file, which I think is brilliant and I am surprised no one came up with this sooner! I am so excited to learn about all the other products you mentioned, particularly the Sephora wand! What a great piece to have for travel, instead of lugging your entire brush kit! I've heard great things about the NYX liner..and the opal sounds awesome! I've never seen eye liner like that before! Might take some getting used to. I've been thinking about saving up for a Clarisonic. I've heard so many good things about them. What a great roundup! That eyeliner looks badass… On the same note as "simple", have you tried Simple makeup remover wipes? They are amazing and great for sensitive skin. I swear by them! Great post Kimberly – I love to know how you keep your skin looking so beautiful! Love #2! Will have to pick one up next time I'm at Sephora. Great post! This is the coolest collection of beauty gadgets. Who knew all these great things were out there? …oh yeah, you did! Great post Kim, the NYX curve eyeliner looks interesting…. Ooo! I was wondering how you did your super fabulous cat eye! Will have to try that! That ergonomic shaped liner is interesting! I am pretty happy with my Stila eyeliner and it gives me a good cat eye almost every time. I might need to try this though, thanks for sharing! 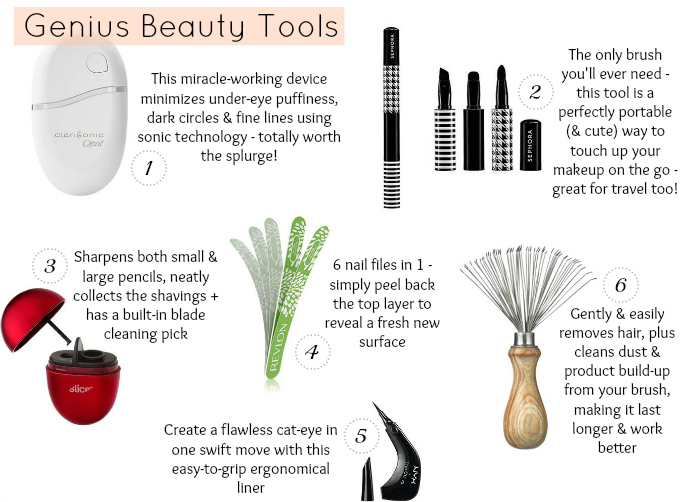 i'm a sucker for all things beauty gadgets… def loving this post! I also vote for a review on the Opal if you do purchase it — would love to hear someone's first hand experience! WOw, such cool products. I need that nail file and the hair brush cleaner (which is always so annoying! ); checking out now. First I've heard of the Opal; I'd be curious your thoughts once you purchase. Do you know people who have? I totally need number 6. My daughter's long hair is like a noose around my brushes. Great post. I have under eye puffiness issues so maybe I should try the Clarisonic opal. Didn't know it existed. I bought the Sephora brush a few months ago and it is perfect for keeping in the purse and travel! Now, if only I could get a similar one that is for powder/blush or powder/foundation…. Multiple brushes in one? Added to my wishlist! I've never even heard of these tools, where have I been?! The peelable nail file in particular sounds like it's just what I need! You caught my attention with the NYX Curve Eyeliner. I'm really curious about that! I always have trouble doing the cat-eye since I tend to get nervous and shakey, so I'm really wondering about this. Please let us know how the Opal is! I'm really curious. Has anyone used the NYX curve eyeliner? Is it any good?